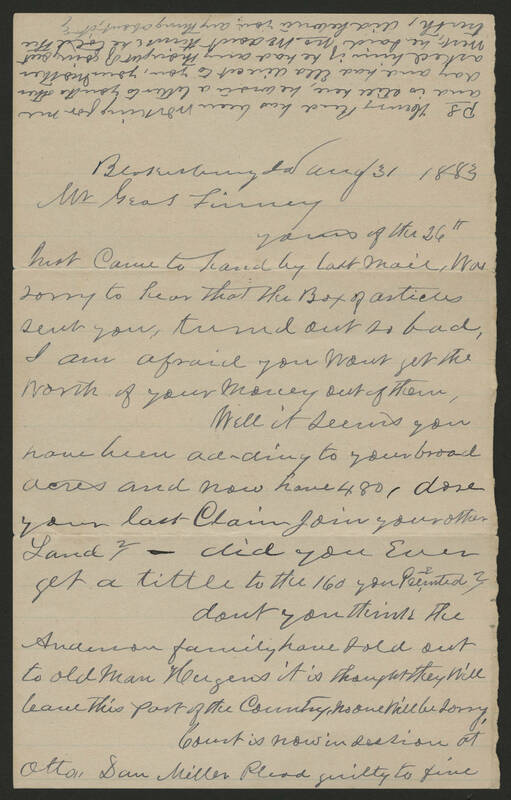 Blakesburg Ia aug 31 1883 Mr Geo S Finney yours of the 26th Inst came to hand by last mail, was sorry to hear that the Box of articles sent you turnd out so bad. I am afraid you wont get the worth of your money out of them. Well it seems you have been ad-ding to your [broad?] acres and now have 480, dose your last Claim Join your other Land? - did you ever get a tittle to the 160 you [presented?] dont you think the Anderson family have sold out to old man Nugent it is thought they will leave this part of the country. no one will be sorry. Court is now in session at Otto. Dan Miller Plead guilty to five Ps Henry Reed has been working for me and is still here, he wrote a letter to you the other day and had Ella direct to you, your Mother asked him if he had any thought of going out West, he said no We dont think he told the truth, did he write you any thing about it?